Mobile carrier SK Telecom said Tuesday that the company and Finnish network equipment firm Nokia have successfully conducted a test run of a group communication system, which enables hundreds of users to communicate over the network at the same time. Since the current LTE network hits a communications bottleneck when a large group of people try to make calls or send messages at the same time, it fell short of being utilized for emergency communication. 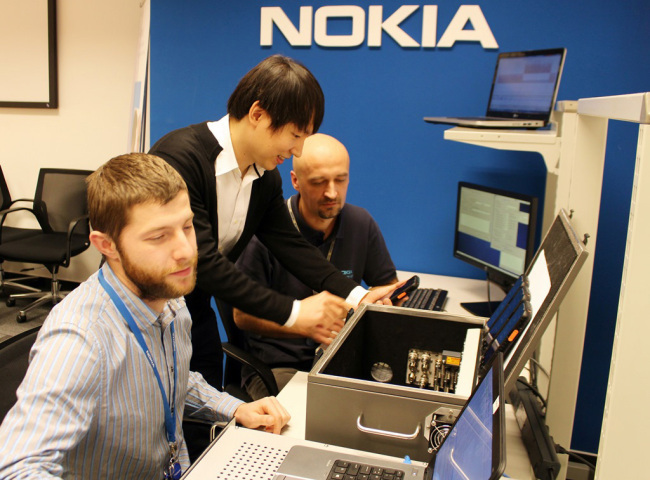 The “group communication system enabler” GCSE tested by the two firms at one of Nokia’s laboratories in Budapest is based on evolved Multimedia Broadcast Multicast Service, which allows delivery of the same multimedia data to multiple receivers. The Korean mobile carrier said the newly introduced GCSE is the most advanced of its type and the closest to commercialization. The new group communication technology will be able to be deployed in projects to build public safety long-term networks at home and abroad. “As the U.S. and European governments plan to install the PS-LTE infrastructure in their nations, there is a high chance for the technology to be deployed in the global markets,” an SKT official said. Korean small and medium-sized firms including information and communications technology solution developer Uangel and Cybertelbridge, a real-time video and voice call solutions firm, also took part in the research and development project for the group communication technology.